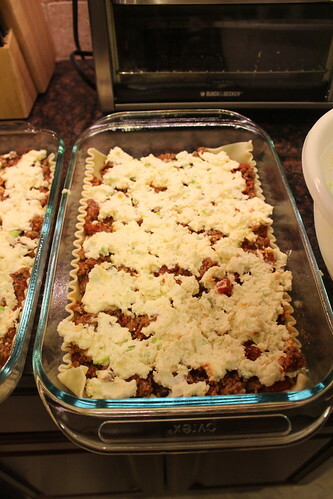 I think a good lasagna recipe is a core component of any recipe collection. 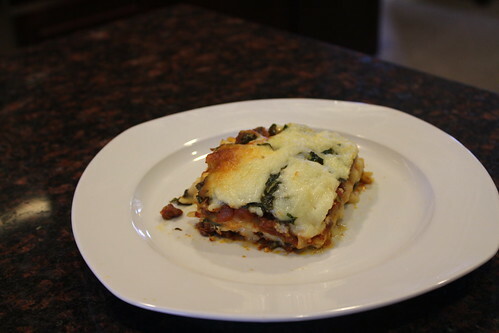 It's wonderful comfort food, and when you add some garlic bread and Caesar salad it makes an easy and excellent dinner for family and friends! 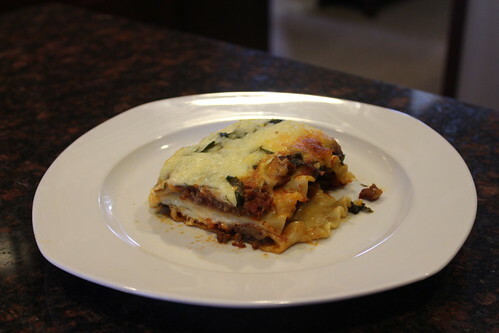 I've stuck with the same lasagna recipe since I first made it my sophomore year of college, and I never get tired of it! It has a little bit of a "kick" thanks to the spicy sausage and hot pepper Classico sauce, and it's nice and substantial thanks to all the meat and the chunky Ragu sauce. Recipe from my friend, Kelly. 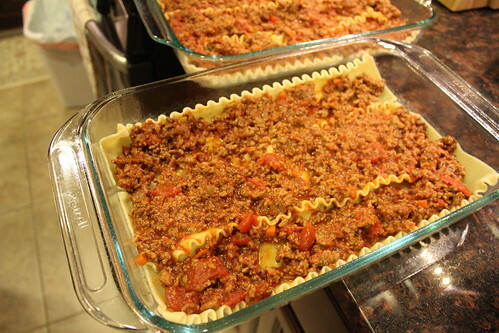 Recipe makes two 9x13 lasagnas. Half the recipe to make just one pan. 1 jar Ragu "Chunky Garden Combination"
1 jar Classico "Hot Pepper"
1. Lightly spray two 9x13 pans with cooking spray. Preheat oven to 350. 2. 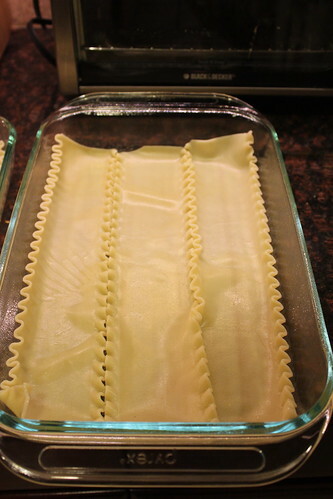 Lay 3 lasagna noodles in the bottom of each pan. 3. 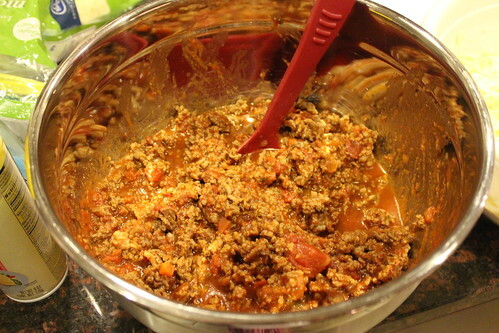 Mix ground beef, sausage, Ragu sauce, and Classico sauce in a bowl. Spread 1/4 of the mixture over the noodles in each pan. 4. 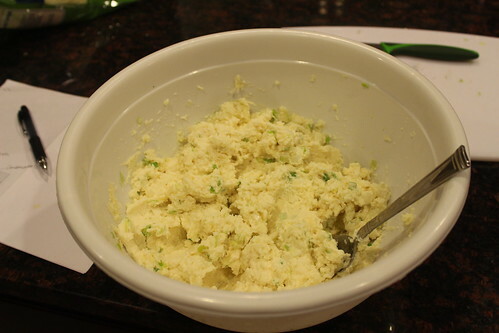 Mix ricotta, eggs, Parmesan, and green onions in another bowl. Spread 1/4 of the mixture over the meat sauce in each pan. 5. 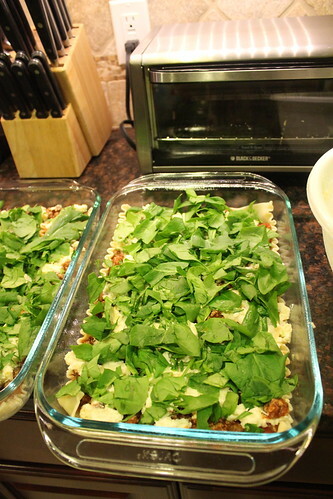 Spread 1/4 of the spinach leaves over the ricotta mixture in each pan. 6. Sprinkle 1/4 of the mozzarella over the spinach leaves in each pan. 7. 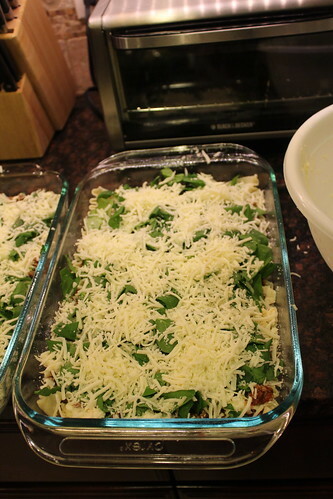 Repeat each layer (three more lasagna noodles, then 1/4 of the meat sauce in each pan, then 1/4 of the ricotta mixture in each pan, then 1/4 of the spinach leaves in each pan, and top with 1/4 of the mozzarella). 8. Bake for 1 hour, or until cheese is lightly crusted and browned on edges. Let cool 10-30 minutes before serving.